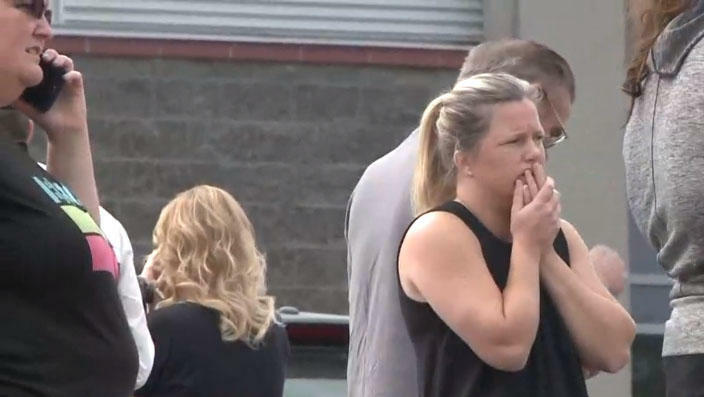 SPOKANE, Wash. -- Officials say a student was shot dead after attempting to confront a gunman at a high school south of Spokane, Washington, CBS affiliate KREM-TV reports. First responders were called to Freeman High School in Rockford around 10:30 a.m. Wednesday morning. KREM-TV reports the suspected shooter was taken into custody. "The threat from the shooter has been eliminated," Spokane Fire Chief Brian Schaeffer told the station. The suspect's name is Caleb Sharpe, according to witnesses who spoke with KREM-TV. Sharpe's family has asked for privacy at this time, the station adds. KREM-TV writes that a parent from the high school said the suspect and the fatal victim were known as "best friends." Spokane County Sheriff Ozzie Knezovich said the shooter, a student, entered the school armed with two weapons. The shooter took out the first weapon and tried to fire it, but it jammed. Another student confronted him, and the gunman took out a second weapon and fatally shot that student, Knezovich said. The gunman then fired down the hallway, shooting and injuring three other students, Knezovich said. While details were still sparse, Knezovich said it appears the gunman was then subdued by the "very courageous actions" of a school district employee. When law enforcement arrived, that employee and a school resource officer were sitting on the gunman to restrain him, Knezovich said. He was then taken into custody. Providence Sacred Heart Medical Center and Children's Hospital received three pediatric patients, spokeswoman Nicole Stewart said. They were in stable condition. Fire officials would not confirm the age of the deceased victim. Schaeffer confirmed the person in custody was the lone shooter and didn't release the suspect's age. Ambulances and a Lifeflight helicopter were sent to the school, which was placed under lockdown along with a nearby elementary school and middle school. Parents were later told that they could pick up their children from the elementary and middle school, but were instructed to wait at a bus barn to be reunited with their high school students as police conducted some 300 interviews with children who witnessed the incident. Student Cory Therman told KREM-TV she saw the suspect holding gun in the hallway before hearing three gunshots. Therman said the gunman walked past her and had "no expression." "It sounded like someone took their binder and slammed it on the ground," Therman said. She took off running with other students and ended up at the elementary school a short distance away. "I felt like I was in a stampede," Therman said. Therman said the school had just practiced a lockdown drill the day before, and some students at first thought the situation was another drill. Michael Harper, 15, a sophomore at the school, told The Associated Press that the suspect was a classmate who had long been obsessed with past school shootings. Harper said the suspect had brought notes to Freeman High in the beginning of the year, saying he might get killed or jailed and that some students alerted counselors. The shooter came into the school Wednesday carrying a duffel bag, Harper said. After shots were fired, students went running and screaming down the hallways, the teen said. Harper said the shooter had many friends and wasn't bullied, calling him "nice and funny and weird." "We're still trying to figure out why he would have done this," Harper told KREM-TV. Schaeffer, who didn't release any information about a possible motive, said the shooting was especially hard for first responders, many of whom have children at the school. Dr. Michael Moore, chief of surgery at Providence Sacred Heart Medical Center, described the injured patients as in their mid-teens and said all were "doing well." "We are thrilled to report that," he said. One would require surgery later in the afternoon, Moore said. He didn't identify the patients or discuss their injuries, citing privacy issues. He said they were with their parents, family members and friends. "It's frightening, I think that's a point anyone can understand," Moore said. "…They want to see mom and dad, they don't want to see us." Spokane Public Schools said on Twitter Wednesday morning that all schools in the district were "in full lockdown as a precautionary measure," and later tweeted the lockdown had been lifted. She said classes were about to begin because it's a "late start" day. Worried parents rushed to the school in the town of about 500 people near the Idaho border. The two-lane road into town was clogged as people sped to the school. Cheryl Moser said her son, a freshman at Freeman High School, called her from a classroom after hearing shots fired. "He called me and said, 'Mom there are gunshots.' He sounded so scared. I've never heard him like that," Moser told the newspaper. "You never think about something happening like this at a small school." Stephanie Lutje told The Associated Press that she was relieved to hear her son was safe after his high school near Freeman was put on lockdown. She commended the school district for its communication with parents. "It's been amazing, within probably 15-20 minutes of hearing about it, I'd already received a phone call, I'd already received a text message saying that their school is OK," she said. Gov. Jay Inslee said in a statement that "all Washingtonians are thinking of the victims and their families, and are grateful for the service of school staff and first responders working to keep our students safe."